The Beautiful Games | Football megastars! Sometimes the hype is justified, sometimes gods walk amongst us and sometimes it's just a load of old cobblers. All hail these footballing megastars - the ones who dare to be different! Oh yes - He shoots like a rocket from any angle, any range! Even with a detached head!. 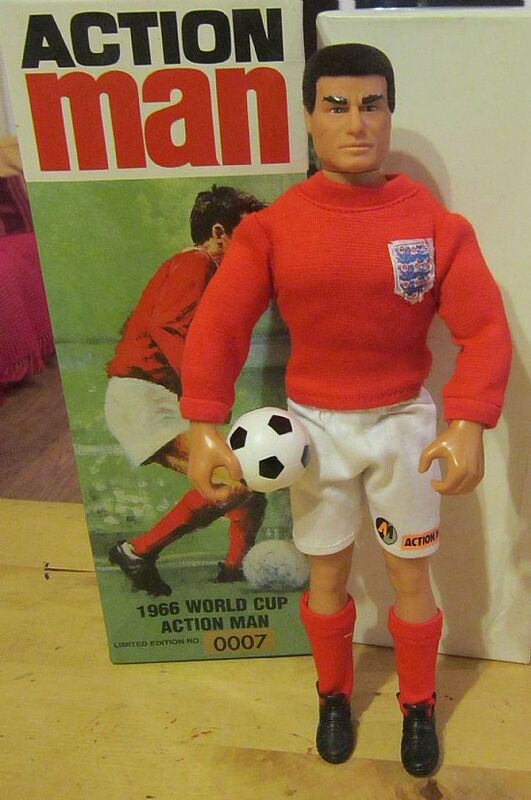 There is no mistaking the world's greatest ever player - even in this shoddy cheap toy version! A very Gallic looking figure from the French Meccano game Shoot! 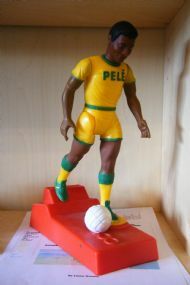 This is a rehash of the Pele Big Kick game with an Andre Previn lookalike. Meet the SDL Star Player. 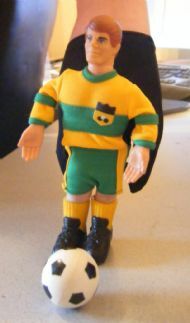 12" of pure footballing skill resplendent in his Mitre kit. 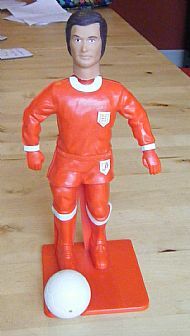 He has no name and came in a number of different figures with a huge range of kits. He still needed a frame in order to stand up straight though. The German legend himself. Never missed a penalty in 4,328 goes. 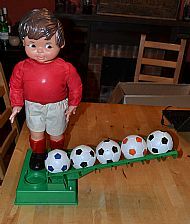 Boxed figure with ball for sale. The box says it all 'Real Men' only required. Look at that physique - even if it is on a glove puppet. 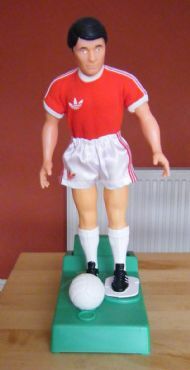 Extremely rare Franz Beckenbauer figure produced by Mego/Lion Rock. 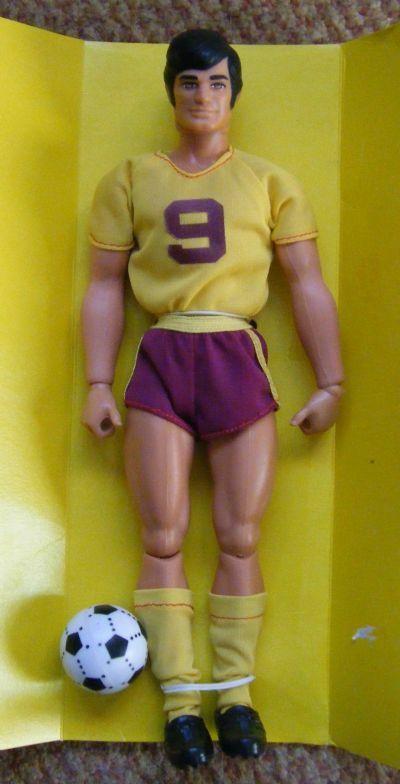 Similar to the Steve Goalgetter series with a unique head sculpt and a mass of accessories. Big Jim - Star Kicker! What a physique, what tightly cut shorts, this guy is one in a million. This is the Big Jim action figure soccer player (a US version of Action Man). Those film star looks, that slick hair - it can only be an Italian footballer. 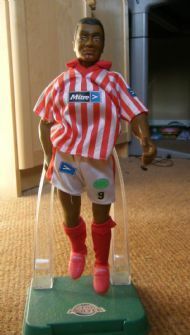 I've no idea where I bought this footballer but I do know he is far too cool to ever actually play football. 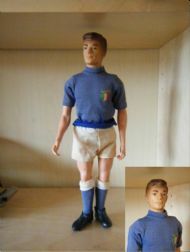 Amazing 1960's 12" footballing doll from Italy.